Then-Republican presidential nominee Donald Trump at a campaign stop in New Mexico on Oct. 30. On Election Day, Trump received 30 percent of Vermont's vote, or 95,369 votes. Since the election, we’ve heard a lot of comments about the presidential race from you, our audience. Many of you were angry or hopeful or worried about the future. And some of you were unhappy with our coverage of the election — particularly, with how you felt public radio unfairly portrayed president-elect Donald Trump and his supporters. The idea for this series came to us from a listener named Dave Carpenter, who lives in the Addison County town of Orwell. Carpenter didn’t vote for Trump, but he was curious about his fellow Orwellians who did. So we paid him a visit to learn more. Last week, Dave Carpenter stopped by the garage of the Orwell Fire Department, because he had a little errand to run. Carpenter is a volunteer firefighter, and he’s also a little intense. “I am currently putting back my — uh, what’s called an air pack, because I ran the Philadelphia half-marathon this past weekend in my firefighter gear and an air pack,” said Carpenter, 48, after heaving the heavy air tank into a truck for storage. “I have a, sort of a predisposition to doing things that are challenging for no good reason other than the fact that they are challenging,” he said. 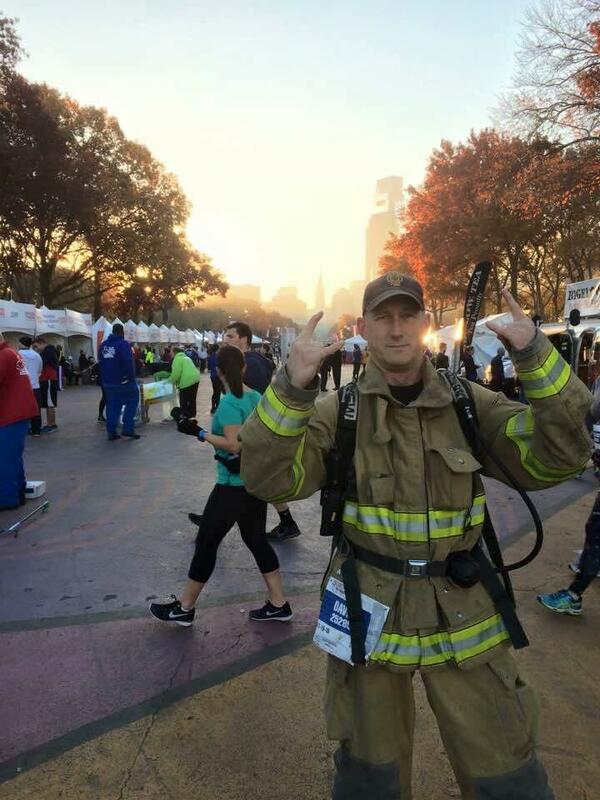 Dave Carpenter recently ran a Philadelphia half-marathon in his firefighter gear, while carrying an air pack. He brings the same intensity to politics, and was surprised when his town, Orwell, went to Donald Trump by 14 votes. Carpenter is equally intense when he begins to talk about the 2016 election. He said he voted for Democrat Hillary Clinton in the general election, but he wasn’t too enthusiastic about it. He still has a Bernie Sanders bumper sticker on his beat-up red Prius. Like a lot of Americans, Dave says he stayed up late on election night, waiting for the final call. And like a lot of Americans, he was surprised by Republican Donald Trump’s victory. Dave says he was even more puzzled when he looked up the results for his own town of Orwell: Trump won the town by just 14 votes, after Orwell handed Obama a comfortable victory in 2012. So Dave wrote VPR a note, asking us to look into not only how Trump won Orwell and other towns, but also why. For the first part of his question, we did some vote data analysis and found some startling (if slightly misleading) numbers: Trump won 61 Vermont towns this year. In 2012, Republian Mitt Romney won just two. While it might seem that Trump fared much better than Romney, in fact, he only got about 2,800 more votes than the former Massachusetts governor. So what gives? The short answer is that lots of Vermont voters cast their ballots outside of the two major parties this year, including for Sen. Bernie Sanders. That allowed Trump to win in towns he might have otherwise lost, had all the Sanders and third-party votes gone to Clinton, said Middlebury College political science professor Matt Dickinson. Trump only won 18 towns with 50 percent or more of the vote; he won 44 with a plurality, of 50 percent or less. We also wanted to try to get at the second part of Carpenter’s question: Why did nearly 100,000 Vermont voters support Trump? Carpenter says he has a hard time squaring the inflammatory things Trump has said with the people in his community he knows who supported him. Carpenter says, even though he might disagree with his neighbors’ politics, he doesn’t think they should be castigated as people Hillary Clinton once called a “basket of deplorables." Instead, he says now's the time people should be listening to each other, even if they disagree. In response to Carpenter's email and his questions, VPR reporters spoke with a number of Vermonters who voted for the president-elect. As the following stories illustrate, each had different reasons for making their choice. Holland town clerk Diane Judd, left, and James Beauvais, right, cast their votes for Donald Trump. Bruce Wilkie, center, voted for Libertarian candidate Gary Johnson. When you get to the end of I-91 in Vermont you can veer left and cross the border into Canada – where a lot of voters disappointed with the recent election results have threatened to go. Or you can exit right down the road towards the tiny town of Holland – population 588. Nearly every Vermont town that touches the Canadian border voted for Donald Trump on Nov. 8 — and percentage-wise he won Holland by one of the largest margins. In their two-room town office that smells of cinnamon, 58 percent of Holland voters cast their ballots for Donald J. Trump and Mike Pence. But by the time town clerk Diane Judd was closing the polls at 7 p.m., Vermont had already been called for Hillary Clinton. Across the country, exit polls showed stark divides in how rural communities voted in the presidential election versus more urban areas. All but one of these rural, northern border towns in Vermont – Jay – voted for Donald Trump in 2016, although those same towns voted for Obama in 2012. 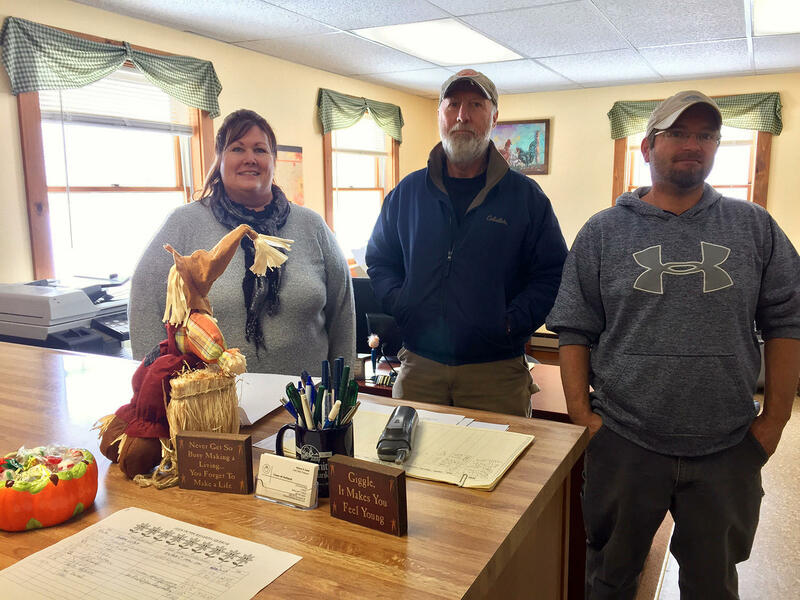 Judd, who voted for Trump, has been the town clerk in Holland since 2008. She says she saw an uptick in voter turnout. In fact, in the northern border towns, there were 747 additional votes in the 2016 presidential election, compared to 2012. One of the Holland residents to head to the polls was James Beauvais. He says that from the moment he heard the slogan “Make America Great Again,” he knew he would be supporting Donald Trump for president. Beauvais has lived in the northern Vermont town all his life, and owns a landscaping business. He thinks that recent presidents and policies have left U.S. citizens behind. Despite Trump's statements about Mexicans, people of Muslim faith and women, Beauvais thinks Trump himself is not a bigot — and he supports Trump's proposed wall bordering Mexico. Beauvais' property literally touches Canada's border. From there, he says he can see the flaws in the U.S. immigration system every day. “They're actually driving by the illegals working on farms and stopping people that actually reside in our town going to work and taking their time up with them, instead of enforcing the federal laws that are already on the books," he critiqued. "They're getting ignored, and you can see the effects." In this area, not everyone voted for Trump – or Hillary Clinton. Bruce Wilkie, a furniture builder in Holland, voted for the Libertarian candidate Gary Johnson. Wilkie is one of 47 people in Holland who voted for candidates other than the two major party nominees. Thirty-one of those votes were write-ins for Bernie Sanders. Residents of Holland don't always feel their voices are heard in Vermont politics, either, but they and others are part of the larger movement that will put Donald Trump in the White House come January. Mary Gerdt, of Monkton, says being in the Trump camp had a different feel to it than other political movements. Mary Gerdt lives on a dirt road in Monkton, where she and 359 other residents voted for Trump. Hillary Clinton won the town with almost twice as many votes, but that didn’t darken Gerdt’s mood the morning after the election. She says being in the Trump camp had a different feel to it than other political movements. And that kind of matches Gerdt’s own politics; she describes herself as a ticket-splitter, and her values don’t fit neatly in any political party. “My parents were both Democrats, you know. It was – it was Madison County, Illinois, I don’t know if you know anything about that, it was very, very liberal,” she says. 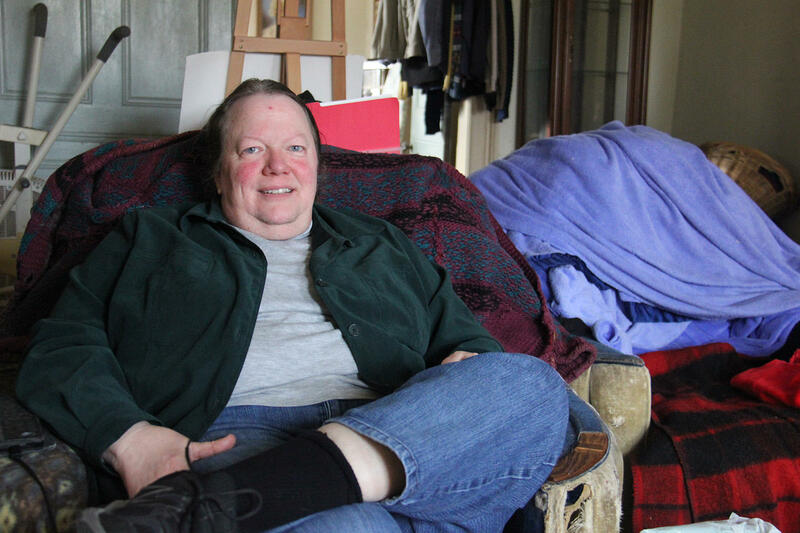 She became a nurse in Illinois, then moved to Vermont and met her husband Fred. And she says the way things started going for her seemed wrong. When she was working for the State of Vermont in 2010, she supported Peter Shumlin’s successful bid for governor. But once he took office, Gerdt's state salary wasn't keeping up with her expenses. "And it just was like, ‘What?' At a minimum I wanted some kind of cost-of-living raise. So here’s a person who’s liberal, but we back-slid on our union contract," she says. Experiences like that made Gerdt think differently about liberals — but she’s not a Republican hard-liner either. She says she has plenty in common with the left. She says she doesn’t like that Republicans are seen as the party that cuts social programs, and it’s clear that for Gerdt, none of this is an abstraction. Her politics have been shaped by her life experiences. “Things that happen to you kind of like make you step back and kind of reassess what you believe in and what’s valuable to you,” she says. And what Gerdt values is complicated. For example, she just wasn't that outraged by the Access Hollywood video featuring Trump bragging about what amounts to sexual assault. She describes Trump's remarks as "Archie Bunker comments," referring to the 1970s TV character who was offensive on social issues. The talk about women on that tape just didn't matter to her. And while she acknowledges he has some personal flaws, Gerdt doesn't think Trump is racist. "Having listened to some of the people that actually know Donald Trump, he is not a racist. So all the labels that he is getting as far as being racist, I mean, he might be a little bit of a sexist pig," she says. Her feelings on refugees aren't simple either. To Gerdt, that didn’t sound unreasonable. Gerdt says she also has concerns about terrorism when it comes to refugees. And while many Vermonters don’t share Gerdt’s feelings on refugees, she does share the hopes many have for more conversation and understanding between people who disagree. Michael Spafford of Clarendon, with his sons Isaac, 11, left, and Trenton, 13. Spafford, an independent, says he voted for Trump reluctantly, but never thought the former reality TV star would win. It wasn't easy for Michael Spafford to vote for Donald Trump. Spafford is 51 and he owns Mike's Country Store in Clarendon. He identifies himself as an independent voter who leans to the right. During the 2012 presidential election, Spafford didn't even vote. He said he couldn't support Romney or Obama. He didn't think Trump would win the Republican nomination this time around, and couldn't muster any enthusiasm for him. But, he says, Hillary Clinton was far worse. Spafford didn't believe Clinton's message. He didn't think she really cared about the working class. With all of the history with the Clinton Foundation and her Wall Street speeches, and emails, it was impossible for him to ignore. "I had no passion for Trump the entire election, and I had no passion for him when I checked his name. I had no passion for him. It was just totally an anti-Hillary vote,” he says. Trump didn't win Vermont — not by a long shot — but he did do better than Mitt Romney did in 2012, and took 59 towns that went for Obama four years ago. And like the national map, Clinton's support in Vermont was anchored around more densely-populated areas like Burlington, Montpelier and Brattleboro. If there was anything like an electoral college in Vermont, the results would have been much closer. In Clarendon, where Spafford lives, Trump outpaced Romney by 6 percentage points. Spafford was turned off by most of what Trump said during the election. And he can't identify with the Tea Party, or with the far right. But all those stories in the media that predicted the former secretary of state's win, Spafford says they missed people like him who weren't ready to back somebody like Clinton. Spafford wasn't the only Vermonter who went into this election feeling uneasy about Trump. The president-elect beat rival John Kasich in the Vermont Republican primary by only 2 points. Spafford says the presidential election is hardly a victory for the Republican Party. Spafford says when he sat down to watch the election results, just like most of the rest of America, he expected a Clinton landslide. He never thought that this divisive, former reality TV star could get enough votes to win the presidency. Spafford says he's ready to support the new president and give him a chance. But he's making no predictions about what the Democrats or Republicans might have really learned during the historic 2016 election. Laura Ryder of Shelburne says she doesn't always agree with Trump, but appreciated his message on two issues: national security and the economy. On Election Day, Laura Ryder walked out of the Shelburne Town offices after casting her ballot. “I voted for Donald Trump, just because he’s new. In my opinion, I think he has possibilities. To me, Hillary Clinton has already proved what she will do and what she has done. So I’m open to something new and to see if he can do anything better,” she said. Like many Americans, Ryder stayed up late watching the results and was surprised that Trump won. In the morning she had a message for her four kids. “I told the kids in the morning, what you need to do is you go to school, you don’t say anything and you don’t gloat. We are a single country full of citizens for America. As a country, whether your candidate won or not, you need to root for the president,” she said. As Christians, she says her kids have felt a lot of pushback at school for their faith and their parents’ politics. 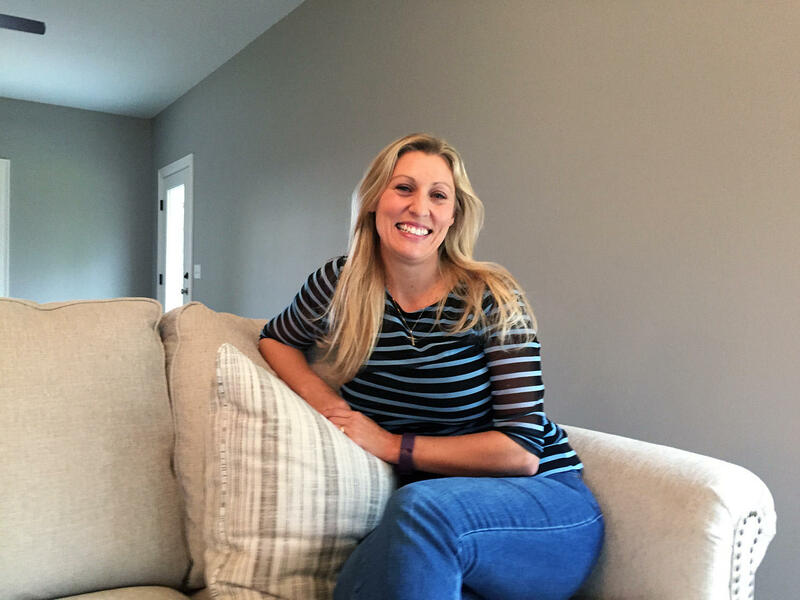 Ryder came to Vermont a year ago so her husband could take a new upper-management position. They're from Missouri, but most recently lived in Texas. Ryder tends to vote Republican, but says she considers every candidate carefully. "The Republican Party tends to match my conservative values and moral beliefs — Christian — and they tend to align with that,” she said. Ryder, 39, stays at home with her kids and makes and sells organic, vegan soaps. She says her religion is the foundation of her family. Trump has disparaged women and made many statements that have contributed to an atmosphere of intolerance toward immigrants, Muslims and minorities. It can be difficult to see how a Christian could support him. But Ryder says her faith guides her not to judge others. Still, Ryder doesn't always agree with Trump, and dislikes some of the things he has said and done, especially regarding women. As for the way Trump has energized right wing and white supremacist groups, Ryder feels racial tension has increased under Obama's presidency. She says those issues require work and forgiveness on the part of all Americans, not just the president. She knows Trump has made comments about banning Muslims, and that's where she says she has to put her faith in the rest of the government. Ryder says she prays for Trump to grow as a person. And while she loves living in Vermont, she knows her faith and her politics are something that set her apart from her neighbors. She says unless Americans come together, nothing will change. This feature is a joint production of VPR News and Brave Little State. Brave Little State's theme music is by Ty Gibbons, and the podcast is made possible in part by the VPR Journalism Fund and Darn Tough Vermont. Gov.-elect Phil Scott says he wants to form a coalition of moderate northeastern Republican governors to help protect the states from policies of the Trump Administration.